Some Spotify listeners got more than just free music with their ad-supported software. 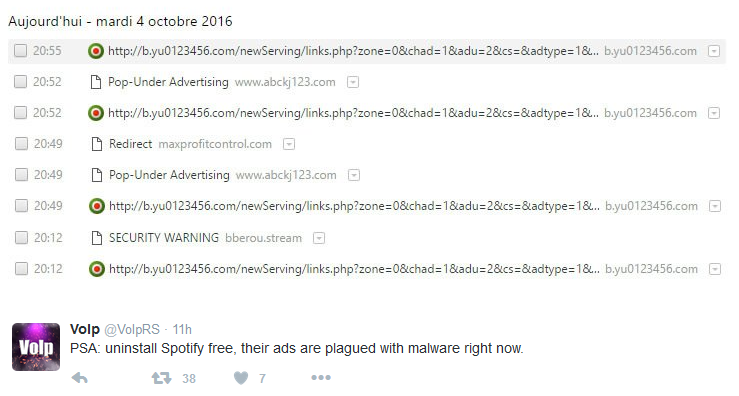 Multiple users report that the streaming service was serving malware-laden ads that would pop up your default web browser in a bid to compromise your system. Reportedly, some of these didn’t even require your input to do damage. And they weren’t specific to any one platform, either — Linux, Mac and Windows users all saw the same behavior, although it’s not clear that the hostile code could damage all three platforms. In response, Spotify tells us that this was the result of an “isolated issue” with an ad, and that it has since “shut it down.” Only a “small number of users” ran into the malware, it says. You can read the full statement below. With that said, it’s bound to be slightly embarrassing when the company ran into a similar issue in 2011. It’s also a reminder of one of the smaller perks of paying for a subscription service: when you don’t get ads in the first place, you’re not at risk of receiving rogue ads.